Flatfish are one of evolution’s more bizarre creations. Yet recent research has suggested their apparently unique morphology may have evolved more than once. A new study, recently published in BMC Evolutionary Biology, investigates just how unique flatfish are, and discovers that the most remarkable thing about them may be the speed at which they evolved. As one would expect from a group that includes 99% of known fish and almost 1 in 3 vertebrate species, the spiny-rayed fishes are incredibly diverse. However, even amongst these incredibly diverse body-plans and lifestyles, flatfish stand out as being singularly unusual. Flatfish, which include many familiar food fish like sole, plaice, and halibut, are defined by a bizarre adaptation: a profound cranial asymmetry resulting from one eye migrating to the opposite side of the skull during larval metamorphosis; or, in simpler terms, they have both eyes on one side of their head. This extreme re-sculpturing of their skulls enables adult flatfish to rest on the seafloor on their eyeless ‘blind’ side, with both eyes pointing upwards (towards potential predators or prey) unobstructed by sediment. This unusual adaptation has clearly been successful for flatfishes, with over 700 species currently in existence. A not so unique adaptation? 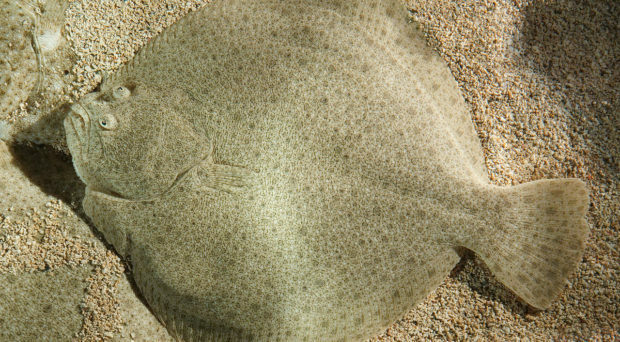 Flatfish can be divided into two groups: the three species of spiny turbot that make up the family Psettodidae, and the much larger suborder Pleuronectoidei. Unsurprisingly, fish biologists long assumed that both groups of flatfish evolved from a single common ancestor; it is hard to imagine such a bizarre adaptation having evolved multiple times. Recently however, this common-sense assumption has come under attack. Several studies have found support for the distinct flatfish adaptation having evolved on two separate occasions. Is the flatfish body-plan not as unique as it appears? Hard to say, has been the honest answer up until now. While there is little doubt that flatfish belong to the wider fish group carangimorpharia (which also includes marlins, swordfish, and remoras), the exact evolutionary relationships among this group are uncertain. Eight recent phylogenetic studies conducted on carangimorphs have produced eight different evolutionary trees, some of which support a single origin for flat-fish, others of which support multiple origins (see figure). Eight different evolutionary trees from eight previously published studies, each with a different relationship between the two main groups of flatfish (colored red) and their carangimorph relatives; half (a, b, g, h) suggest that flatfish evolved just once, but the other trees suggest the distinct morphology evolved on two different occasions. Figure from Harrington et al. 2016, see paper for source of individual trees. A new study, from a team of researchers led by Matt Friedman of the University of Oxford and recently published in BMC Evolutionary Biology, aims to resolve these issues. Making use of recent advances in phylogenomics and high-throughput DNA sequencing, they have assembled a dataset of ultraconserved DNA elements (UCEs) and their flanking sequences from over 1000 loci in 45 different carangimorph species. UCEs are, as the name suggests, parts of the genome that are identical across distantly related species; for example, many fish share certain UCEs with humans. They have become increasingly widely used in evolutionary studies in recent years, having demonstrated considerable potential to resolve obscure evolutionary relationships (including in ray-finned fishes) due to the sheer volume of genetic data that can be efficiently produced. UCEs seem to have been successful in untangling this tricky problem as well. The evolutionary tree produced from the researchers data-set is statistically well-supported and remains robust regardless of the analytical framework applied (an important consideration in this kind of research, given that different frameworks will always involve certain assumptions). Crucially, this tree strongly supports a single evolutionary origin for flatfish. It appears that this evolutionary novelty really is unique. The new research also provides a reason as to why it has been so difficult to pin-down flatfish evolution; it happened incredibly quickly. The researchers believe that the flatfish body-plan, with complete orbital migration of the eyes, evolved in no more than 2.9 million years. While a long-time by human standards, this is remarkably quick in evolutionary terms. The distinct body-plans of flatfish relatives like moonfish and billfish took 2-3 times longer than this to evolve, while we can also compare the time it took for anatomically modern humans to evolve (around 7 million years) or whales to evolve their body-plan (around 20 million years). Indeed a few million years is the same amount of time estimated for the diversification of some radiations of cichlid fish in African lakes, long considered a pre-eminent example of ‘explosive’ evolution. Flatfish appear then to be emblematic of a common problem in reconstructing the evolutionary histories of rapidly evolving lineages. When evolution moves so quickly, it leaves less ‘evidence’ behind it, in the form of other genetic changes which allow determination of relationships within a lineage. The use of large datasets, like those provided by high-throughput sequencing of UCEs, becomes necessary in such cases to untangle evolutionary relationships. Flatfish, then, are doubly remarkable. Their incredibly distinct morphology is indeed a unique adaptation that has evolved but once. We now realise they are also noteworthy for having undergone such drastic changes in nothing more than the blink of an evolutionary eye.